I am a sucker for these science fiction-adventure-conspiracy theory stories. I watched The Event, Flash Forward and Terra Nova. Unfortunately, none of these series made it to the second season. While all of these series had a great storylines they were unable to maintain viewership long enough to truly develop the characters and fully detail the conspiracy that was an important component of the show. This year’s version is Revolution. The show is produced by J.J. Abrams and the pilot episode was directed by Iron Man director Jon Favreau. As the pilot opens, we see the nighttime skyline of Chicago. Ben Matheson (Tim Guinee) rushes home to his wife, Rachel (Elizabeth Mitchell) and tells her we don’t have much time. She knowingly responds that ‘it’s happening, isn’t it’? Frantically Ben begins to download important information from his computer into a silver, heart shaped, thumb drive. At the same time he calls his brother Miles (Billy Burke), to warn him about the impending event. Mid-conversation every piece of electrical equipment around the world goes out. Phones disconnect, computers power down, cars stop in their tracks, planes fall from the sky and satellites crash to earth. In a very cool scene, his brother Miles stands on the highway and looks back at the cars behind him as their lights go out in sequence. The earth is now in total darkness. Three minutes into the show, I am hooked and can’t wait to see what happens next. Just as quickly Revolution jumps 15 years in the future. There is still no power. Governments around the world have toppled and the country is now controlled by local militia and dangerous highway gangs. The series focuses on the Matheson family, who possess an item (the silver heart shaped thumb drive) that is the key to finding out what happened fifteen years ago, but also a possible way to reverse its effects. However, they must elude various enemy groups who want to possess that power for themselves. • Billy Burke as Miles Matheson, former US Marine Corps sergeant turned tavern owner and pursued by the Monroe Republic militia. • Tracy Spiridakos as Charlotte “Charlie” Matheson- his niece who tracks down Miles after her brother Danny is abducted. • Anna Lise Phillips as Maggie, a medical doctor who became involved with Ben Matheson following his wife’s death. • Graham Rogers as Danny Matheson- Charlie’s asthmatic brother who gets captured by the militia. • J. D. Pardo as Nate Walker, a soldier of the militia. • Zak Orth as Aaron, former Google executive and close friend of Ben Matheson. • Maria Howell as Grace, a woman who hides Danny from the Monroe militia and also has a necklace matching the one Ben Matheson gave Aaron. • David Lyons as Sebastian “Bass” Monroe, former US Marine Corps sergeant turned warlord of the Monroe Republic. Monroe was Miles’ friend prior to the blackout. • Giancarlo Esposito as Captain Tom Neville, former insurance adjuster who joined the Monroe Republic militia after the blackout. • Tim Guinee as Ben Matheson- Charlie and Danny’s father, who apparently knows the cause of the blackout. • Elisabeth Mitchell as Rachel Matheson- Charlie and Danny’s mother. Unless this show uses a lot of flashbacks the roles of both Ben and Rachel Matheson will be limited because they both die in the pilot episode. Ben is killed by the militia trying to capture him and Rachel dies of natural causes when the series moves ahead fifteen years after the blackout. For me, the pilot was a winner. I like the story line. 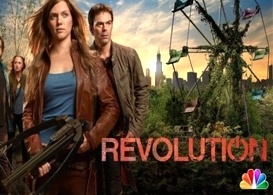 The characters especially Billy Burke as Miles Matheson and Tracy Spiridakos as Charlotte are likeable and there are already enough questions that I need answers for to bring me back for the next episode. The key to the series will be whether the conspiracy theory and the answers to the questions planted in the pilot episode will keep viewers tuning in or send them away in search of old Friends and Seinfeld episodes.